Sponsorship Planner is a stand-alone card deck containing everything a rights holder needs to design and negotiate sponsorship packages, and a sponsor needs to build their understanding of the sponsorship options that are right for their goals. An easy and fast way to design and negotiate sponsorship packages, the deck requires no training or experience to use. Simply select up to three of the eight sponsorship objectives, and then up to five of the sponsorship offerings linked to each selected objective. 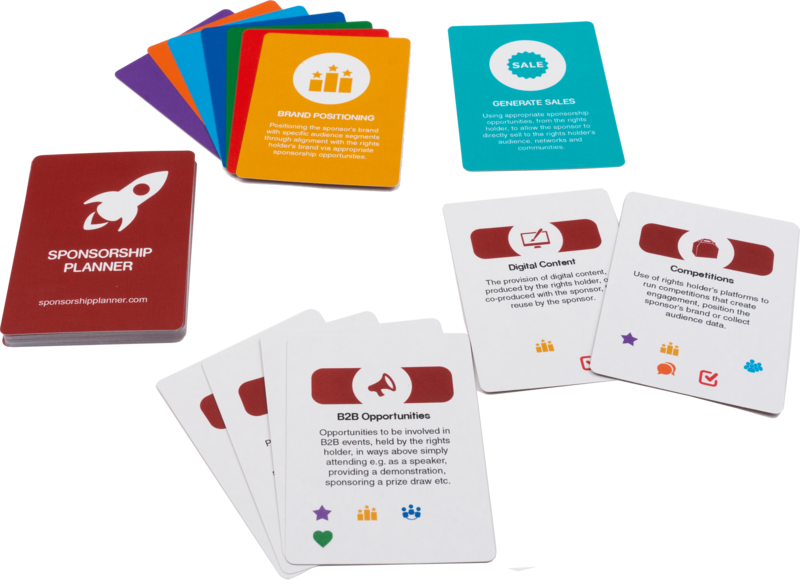 For businesses new to recruiting sponsors, the deck can help them design their sponsorship plan and inventory and discuss opportunities with prospective sponsors. For organisations with substantial sponsorship experience, the cards make it easier to sit down with business owners with limited sponsorship experience and tailor a sponsorship package that precisely meets their needs.